I found the ink outline of this bird while flipping through my sketchbook this afternoon and I decided that this was a good day to fill-in-the-blanks. This bird and its migration buddy were my first ever Palm Warbler sightings. Two days later, I saw two more Palm Warblers in Mill Creek Ravine Park. This fall, my only Palm Warbler sighting was a trio at Roper Pond. 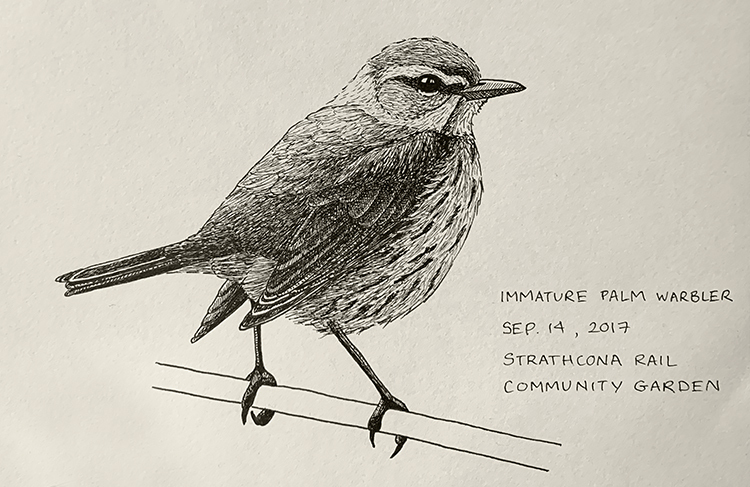 According to eBird data, Edmontonians only see Palm Warblers during spring and fall migration. Spring sightings are less common than fall sightings, and personally, I’ve only seen them in the fall.